For process control and commercial or industrial applications, there are numerous methods of flow measurement from which to choose. Technologies range from very simple applications of physical principles to deployment of very specialized electronics and sensors. The available range of accuracy, response, and cost is quite broad, with a general expectation that higher cost will deliver better performance and accuracy. Making the best instrument selection for a flow measurement application should include an assessment of what the operators really need in order to safely and effectively run the process or perform the task related to the measurement of fluid flow. Installing instrumentation with capabilities far beyond what is required is almost certainly a waste of financial resources, but may also have an unexpected impact on operators. Through the generation of data that, while accurate, does not provide any actionable information about process condition, operators can be misled, similar to the occurrence of a false or nuisance alarm. Some applications call for high accuracy, some do not. Define your informational needs and select instruments that will meet those needs. There is a large array of applications that can be satisfied with simpler, less costly measurement technology. 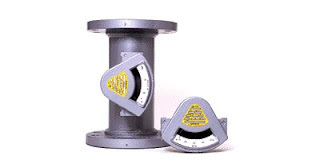 These devices often employ turbines or vanes to produce an indication of flow rate. Incorporated into some of the instruments is a means to visually observe the flowing liquid to verify color and clarity. Simple devices sometimes are intended only to indicate the presence of fluid flow, and whether the flow rate is high or low. Configurations are available that allow insertion into lines under pressure (hot tap) through a full port ball valve. Other variants with combinations of features and capabilities abound. The selection range is enormous, so define your minimum needs first, then search for a compatible product. Your search can be enhanced by contacting an instrumentation specialist. Combining your process expertise with their broad product knowledge will produce effective solutions. Variable Area Flow Meter - SeeFlo from Classic Controls, Inc.